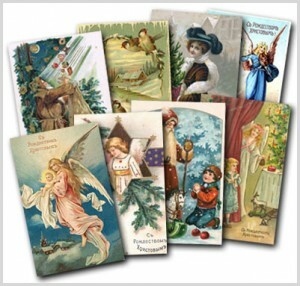 The tradition of giving Christmas greeting cards goes back more than 150 years. The very first European greeting cards were made in Christian countries during the medieval ages and involved skillful hand-carving and hand-printing. Russian Orthodox Christmas Cards initially were designed by artists and book illustrators mostly in folk style depicting winter scenes, angels or Christmas tree with ornaments. By the end of 19th century advances in photo-mechanical processes in lithography made Christmas cards more affordable for general public and they promptly gained popularity. Small numbers of the hand-designed cards were gradually replaced by cards incorporating elements of religious paintings. Westernization of church architecture and Orthodox art was wide spread. While not completely forgotten, traditional Orthodox icons were not too popular, even among the clergy. One interesting fact is that Russian Orthodox church somewhat discouraged putting images of icons on greeting cards saying that disposable paper is not the place for holy images. At the same time thousands of official Orthodox magazines and newspapers that contained multiple icon images were published, read and disposed of every year. Some of the latest printing methods of that time, such as oleography or collotype, were also used for mass production of icon prints on metal, fabric, and wooden boards. Nowadays one might expect to find greater selection of Orthodox Christmas cards than a hundred years ago but this is not always the case. Although printing quality has improved dramatically, a substantial portion of printed products for Orthodox Christians lacks innovation in design and style despite the fact that customers are always looking for something new and unique even within Orthodox Christian traditions. 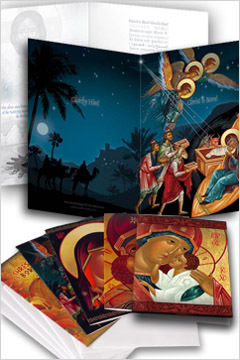 Publishers of Orthodox Christmas cards are seeing a constant decline in sales still are not creative with new designs of traditional paper products such as Nativity Christmas greeting cards. Needless to say, email and e-cards took out a big portion of greeting card business but at the same time printing technology made tremendous progress in terms of quality, ability to print affordable short runs or print-on-demand unique custom greeting cards. Art historically embodies any epoch it parallels with a distinct evolution of decor, style, technique and materials. Regrettably, this is often forgotten by Orthodox Christian publishers that think of Christmas cards with icon images as printed reproductions. There has never been a better time for greeting cards, particularly for Orthodox Christmas cards, to become more than a photo copy of a piece of artwork attached to your greeting. With the new array of tools we are able to produce sophisticated layouts in record time. Our predecessors were amazingly creative with limited sets of tools and it is a shame that we are not even trying to reach their level of creativity. We admire frescoes on the walls of old Orthodox churches and the way they organically transform the interior into a living background for worship and prayer. Why can’t Orthodox greeting cards and posters play somewhat similar role? 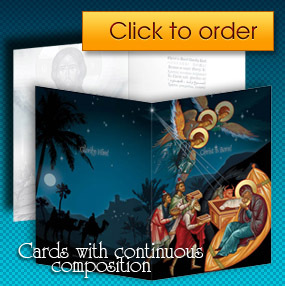 In addition to several Nativity Christmas cards that are available with continuous composition going from front to back, there are other variations of Orthodox Christmas cards, some of which are customizable. Regretfully, these custom Christmas cards can only have a partial image on the back of the greeting cards, although the inside spread allows full customization with pictures and text. 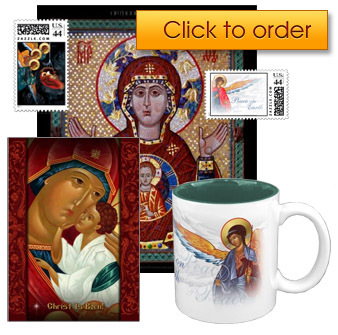 These cards are produced and shipped by our Zazzle store specializing in Orthodox Christmas cards and other Orthodox gifts. For quantities of a 1000 greeting cards or more and large custom orders you may contact us directly. Adoration of Magi Christmas cards (shown on this page) are available with custom changes and imprinting inside for quantities of 1000 & or more. Customizable greeting cards can be purchased in small quantities from our “Buy Custom Christmas Cards & Gifts” page. Don’t forget to check out some unique orthodox gifts on this page!